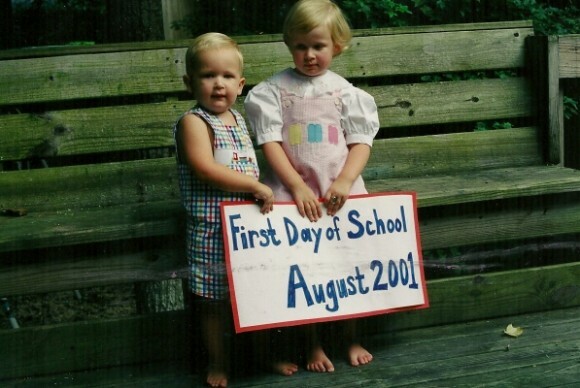 We have this annual homeschool tradition – a student photo with the First Day of School Sign. First we do a simple pose. For many annual photos the children would pose on the front steps. 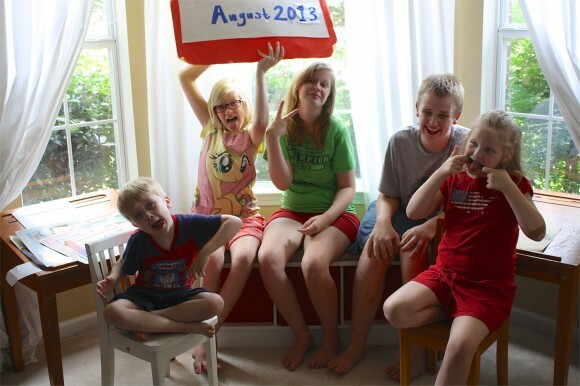 But this year we decided our homeschool room bay window would be a good spot for the Hodgepodge Homeschool Photo. Then, of course, we do the crazy ones! Because that’s really what a good portion of our homeschool is like. Remember the Imperfect Homeschool: Drama and Trauma I shared with you? But here’s something that will give you even more of a picture. It’s a Hodgepodge video! This year we even recorded an eight second video of each child sharing the grade he or she is in this 2013-14 homeschool year. You can even subscribe to the Hodgepodge YouTube channel. Soon we hope to be sharing art tutorials from Nana! A little update on our slow start to homeschool. We cranked things up! Last week we were only doing our Before 8:45 checklist, math, then the pool. This week we added in language arts on top of that. It’s been a true mixture of spelling, grammar, handwriting, Teaching Textbooks and Saxon math. (Our Hodgepodge Curricula 2013-14). And we still made it to the pool a couple days too. 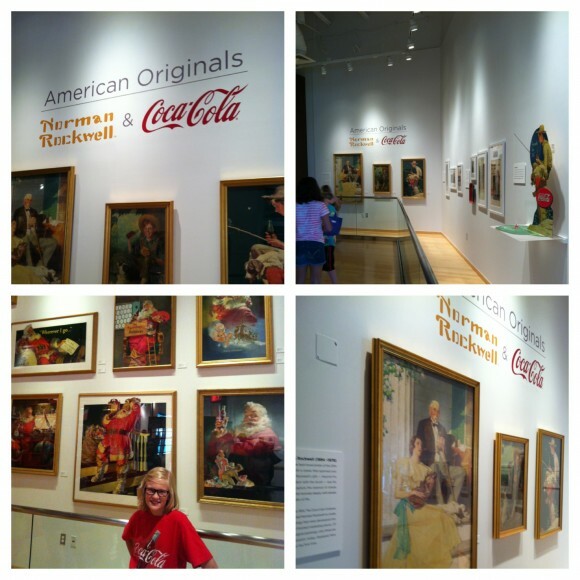 Seeing the original Norman Rockwell paintings he was commissioned to do for advertising. We published our Help! 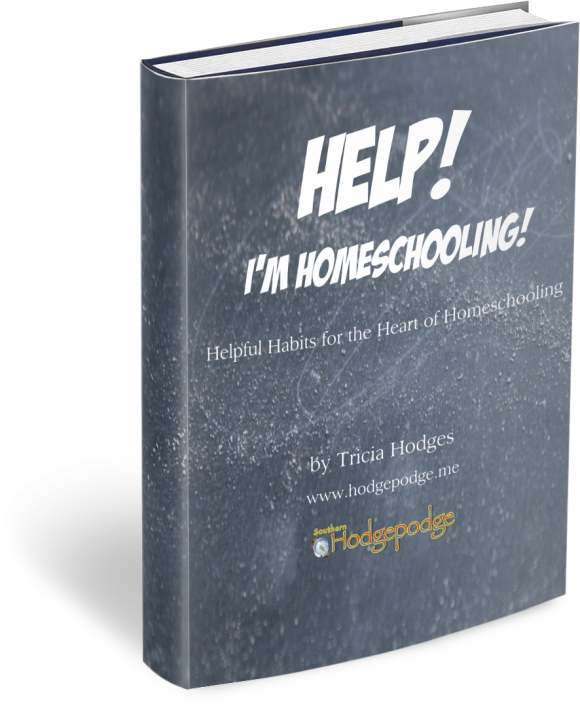 I’m Homeschooling ebook! Over a dozen years of tried and true helpful habits for the heart of homeschooling. It is also available as a bundle with our chalk pastel tutorial ebooks and Return of the Routine! 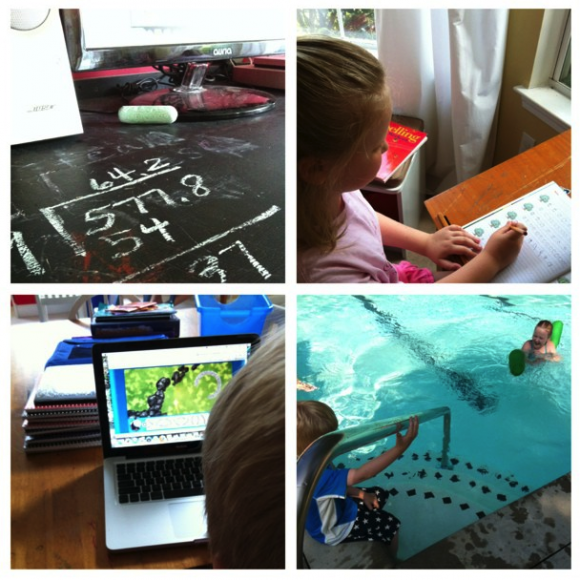 This past week has definitely been a hodgepodge of wonderful homeschool happenings. I wanted to be sure you know about these! 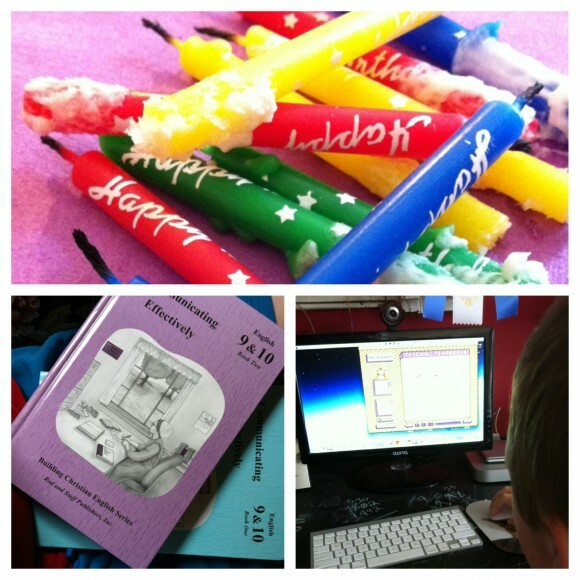 Rebecca at Mom’s Mustard Seeds is giving away our Help for Homeschool bundle! 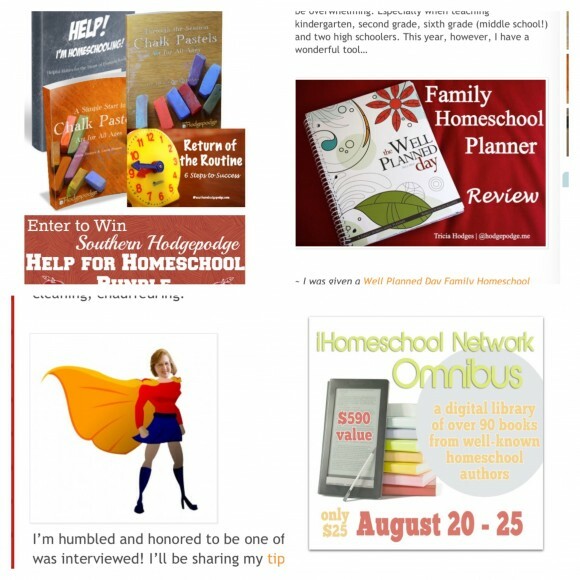 Subscribe to Homeschool Super Heroes to get two weeks worth of encouragement for FREE! iHomeschool Network’s Omnibus goes on sale next week! The sale starts early Tuesday morning and only runs for five days. Stop back by here to get your copy – a huge stockpile of digital curriculum and encouragement for only $25! 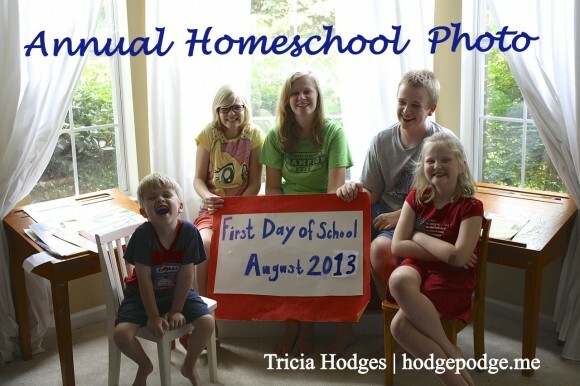 And be sure to check out all the student photos during iHomeschool Network’s Not Back to School Blog Hop! Have you had a hodgepodge of a week too? And, you didn’t know I had a cape did you? I remember the first day of school 2001 picture from last year — so so sweet, Tricia. What wonderful memories you are building for your kids. Your blog just makes me HAPPY. Thank you Mary!! And thanks for spurring me on to get pictures – for collages. Such fun to look back over the week. I would love to see the Norman Rockwell art. What a great little video clip. Love the baby toes. Can’t wait to see what fun stuff you add to your YouTube channel! Love the first day of school pics! We have never done them…but so love the idea! Pics are great! Love the candle one! What a great list of giveaways happening…thanks for all the links! enjoy your weekend! Those candles covered in frosting sure tell a story, don’t they? The pictures are adorable. I’m kinda bummed I didn’t do anything special for our first day of school, but my daughter is working on the year book and collecting pictures for it. I love the annual pictures and I agree that that spot is a perfect place for a group photo. I would love to go to the Coca-Cola museum. Perhaps one year… Your week looks lovely. I always enjoy seeing that precious picture, Tricia! Oh, those sweet babies! And the pictures of the “grown-up” Hodgepodge kids! Each one a joy! Love the start of school photos 🙂 I think I will have to take one of my little boy! I agree, baby toes make me smile too. Oh my goodness at that first year photo (and those baby toes)! I love how you slowly get back into school, and your first day photos. What a great idea! My brother and I fiercely resisted photos when we were children and now I wish we had something like this to look back on. By the way, the hand symbol that Eldest Girl is making in the silly photo is a swear sign in the UK – thought I’d let you know in case you ever come over here to visit! It’s funny how different gestures have different meanings (the other way around it’s perfectly innocent, strange really).